The day Zaventem airport and the Brussels metro system were hit by terrorist attacks was the day the Tindersticks would play in Leuven. Het Depot took in rerouted travelers all day, and was still ready for a concert at night. Very impressive! As we were parking our bikes at a random illegal location on the station square, a couple asked me in English where the night shop was. When they said they wanted to buy a converter there, I realised they were the aforementioned rerouted travelers. They looked tired. I explained the shops would be open tomorrow and that our main shopping street was here. The girl said “It’s very cute here. Well, I want to call it cute, but I don’t think I can at the moment” and she started crying. “Take a walk to the city library tonight,” I said encouragingly, not knowing what to say. “It’s beautiful and I think they have a memorial”. “Is it safe here?” she asked and she sounded so scared. “Yes”, I said, shocked that anyone in MY town could think otherwise. “Yes, it’s safe”. We shook hands and left for our concert. The moment we stepped into the hall, I realised we should have taken those stranded travelers out for drinks. Shown then the city, or shown them anything positive. Restored faith in humanity and all that. Instead we drank beer and followed Stuart Staples into a minute of silence. The Tindersticks must have been one of the first bands I ever saw in concert. Today, about twenty years and fifteen albums later, they still have the same sound that grabbed me at the Crossing Border Festival. It has mellowed out a bit, though, and the beautiful threat of dissonance that used to loom over their music has faded into the background. It only came out on We are dreamers! which evolved into a lovely jam session where Staples just hit his guitar strings at random. It was a good night to be out at a concert with other people, a good night to be comforted by soothing songs and Staples’ beautiful baritone. A good night to be safe in Leuven. Geschreven door First Row Seats en gepost op 4 april 2016 onder Muziek. 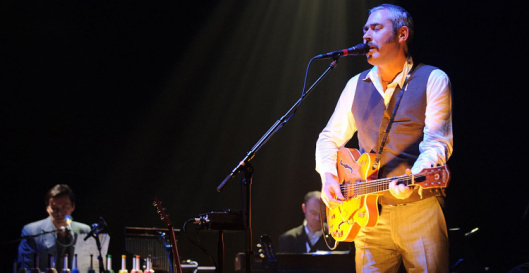 Deze post werd getagd met het depot, Tindersticks. Comments Off on Tindersticks @ Het Depot op dit artikel.